The ACT, a curriculum-based standardized test for college admission in the USA, is given by the Iowa-based company formerly known as American College Testing, and now called ACT, Inc. The test is used in college admissions in the same way as the SAT. In use since 1959, the ACT is considered an indicator of academic aptitude and readiness to enter college. Although the ACT is not as well-known as the SAT, it is almost as widespread – every college that accepts the SAT also accepts the ACT for admission, scholarships, and honors programs. The ACT was originally conceived as an examination of achievement. Historically, the SAT had been more popular among colleges on the East and West Coasts and the ACT more popular in the Midwest and South. However, all that has changed, as the two tests are now equally accepted by all colleges that require standardized test scores for admission. In fact, there are a number of high-profile colleges that will accept just the single ACT composite score in place of a combination of SAT Reasoning and Subject Tests. In February 2005, an optional essay was added to the end of the ACT, mirroring changes made to the SAT in March of that year. Not all colleges require the essay, so it's a good idea for the student to check with colleges to find out if the essay is required. The test takes almost 3½ hours with the essay and just under 3 hours without it. Some students who perform poorly on the SAT find that they perform better on the ACT and vice versa. In fact, because the ACT is based on what is taught in the high school curriculum, some students are more comfortable with the ACT than they are with the SAT. In actuality, approximately ⅓ of students perform better on the ACT, ⅓ perform better on the SAT, and ⅓ perform exactly the same on both tests. To help determine which may be the better test for a student, click on SAT vs ACT – Which is the better test for you? How is the ACT organized and scored? 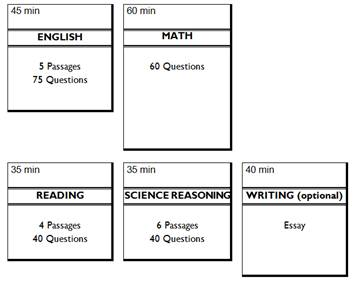 RAW SCORES for English, math, reading, and science reasoning are converted* to TEST SCORES ranging from 1 to 36. Additional scores are generated if a student writes the optional essay. It is scored by two readers who read the essay holistically (for an overall impression), and independently give the essay four specific “writing domain” scores (Ideas and Analysis, Development and Support, Organization, and Language Use and Conventions) in the 1-6 range. The two readers' scores for each domain are added together and appear on the score report along with a Writing Score on a scale of 2-12. The domain scores don’t necessarily add up to the Writing Score. The Writing Score is not averaged into the Composite Score. The conversion tables effectively "scale" a test, taking into account the difficulty level of the particular test and the ability level of the test takers. If a test is somewhat more difficult than, say, the test given a few months earlier, then the scale is raised a bit. If a particular test is easier, the scale is dropped a bit. It doesn't matter when or where a student takes the ACT, because conversion makes all scores comparable. How is the ACT used in college admissions? For the majority of colleges, the ACT (or SAT) score is the second most important factor in college admissions, second only to the combination of a student's curriculum and grades throughout high school. Of roughly 800 colleges that do not require a test score for admission, only about three dozen are selective liberal arts colleges (e.g., Bates, Bowdoin, Holy Cross, Franklin & Marshall, Mount Holyoke, Rollins, Sarah Lawrence, Wake Forest, to name a few). Chances are that most students will apply to colleges where test scores are vital to the admissions decision. And several of these test-optional colleges require a test score for scholarship consideration. If a student chooses to report ACT scores rather than SAT scores when applying to college, he or she must contact ACT (www.actstudent.org) to send an official score report to each college (unless the student already did that when registering for the test). The ACT score report contains a single set of four subscores (one from each of the test's four sections), a writing score, a combined English/writing score, and the Composite Score (the average of the four subscores). With only one set of such scores on the ACT score report, the student can automatically suppress unwanted scores from other test dates. Most colleges do not "super score" the ACT. That is, they tend not to select the highest subscores from multiple ACT administrations, which is why the official ACT score report contains the scores from only one ACT administration. (This is in direct contrast to the SAT, where most colleges "super score" by selecting the best subscores from multiple SAT administrations.) Remember, calling colleges is the best way to determine their ACT policies. Admission records show that a score near the top of the mid-50% range for a college's accepted students plus a strong curriculum with good grades and meaningful extracurricular commitments will significantly improve a student's chances for admission. The ACT (and SAT) scores are used for more than just college admissions. They may be used to help determine financial aid, scholarships (like Florida's Bright Futures), admission into honors programs, and placement in freshman courses. How do colleges use the ACT writing & essay scores? Colleges are able to access and read a student's scanned, handwritten essay. Interestingly, some colleges, like Georgetown, do not use the essay score at all! In any case, it is important for students to master the skills necessary to do their best on the essay portion of the test since writing is a vital skill for college and beyond. And remember: all colleges will receive the ACT essay score of a student who took that section of the ACT, even if the colleges don't require it or say they don't use it. What does it take to get into a state university in Florida? Download our recommened PDF: What does it take to get into a state university in Florida? When should my child start preparing for the ACT? How much test-prep is needed? For most students, effective ACT preparation should begin the summer after tenth grade – and continue until a student has taken his or her final ACT. There is no limit to the number of times a student may take the ACT, but he or she should prepare for each one or risk diminished results. The ACT score report is not a cumulative report containing all of a student's ACT scores; rather, it contains the scores from only one test administration selected by the student. Thus, some students may even want to start preparing for and taking the ACT before the end of the sophomore year. With all the tests your child may be taking in high school – PSAT, SAT, SAT Subject Tests, PLAN, ACT, AP, IB, AICE – it is vital to have a game plan, and the earlier it is established, the better. In fact, some families begin their 8th and 9th graders with us, building their reading and vocabulary skills with our TestWise program. When you call Score At The Top, you'll talk to our specially trained director, your personal guide to the test-preparation process at Score At The Top. He or she will suggest a plan of action – small group, private, and/or semi-private lessons – with a timeline and program to bring out the best in your child. The action plan may also contain a recommendation for our SAT vs ACT Assessment Test that can help a student determine which is the better test for him or her, and thus avoid having to take – and prep for – both tests. How much of an ACT score gain can be expected? Most students who seriously prepare for the ACT with us should expect significant score gains of 3+ composite score points. And some of our motivated students have enjoyed gains of over 10 composite score points! Here's the "double-edged sword": some of our students have achieved such impressive score gains that they were challenged by ACT and had to re-take the test to prove the legitimacy of their higher scores! While the above results reflect score gains we have observed, we do not guarantee score gains.